National Support for Working Families—Chime In! Although I’ve voiced my own frustrations about the U.S. government’s lackluster or nonexistent policies around issues like work flexibility and paid leave, I recently attended an event that served as an excellent reminder that there’s actually widespread governmental support for positive change. At last month’s New York Forum on Working Families hosted by the White House, the Department of Labor, and the Center for American Progress, representatives from all levels of government shared their views on the need for better support for working families across the country. Family Time: Secretary of Labor Thomas Perez noted that “life is fragile,” and that the “most important family value is the value of time with your family”—he himself fits in time to coach his own kids’ sports teams, and added that more than putting food on the table, it’s important to be at the table (and we need better policies to help make that possible). Paid Sick Leave: New York City Mayor Bill de Blasio advised that “if our working families are going to succeed, we have to do things differently”— starting, for example, with the paid sick leave act he signed into law in New York in March. Changing Workforce: Senator Kirsten Gillibrand proclaimed that “the face of the American workforce has changed since the Mad Men era,” but that our workplace policies have not kept up. She spoke in support of paid maternity leave and her proposed FAMILY Act. Balancing Home and Work: Valerie Jarrett, Special Advisor to President Obama, shared her personal experiences needing work flexibility as a single working mom, and noted that we have to be able to bring the realities of our homelife into the workplace. U.S. Representatives Charles Rangel, Nita Lowey, and Jerrold Nadler, Manhattan Borough President Gale Brewer, work-family advocates, and executives of progressive companies also all added to the chorus calling for change. In addition, 1MFWF Supporter Scott Behson of Fathers, Work, and Family, was a featured panelist, and in fact the event was also a great opportunity for me to meet in person with him and other 1MFWF supporters (I’m a virtual worker the majority of the time, but that doesn’t mean I don’t see the value in face-to-face connections!). Emily Seamone, Rachael Ellison, Allison O’Kelly, and a big group from Catalyst were also on hand, along with hundreds of others committed to helping tackle problems facing our working families. Best of all, the event was free and open to the public. 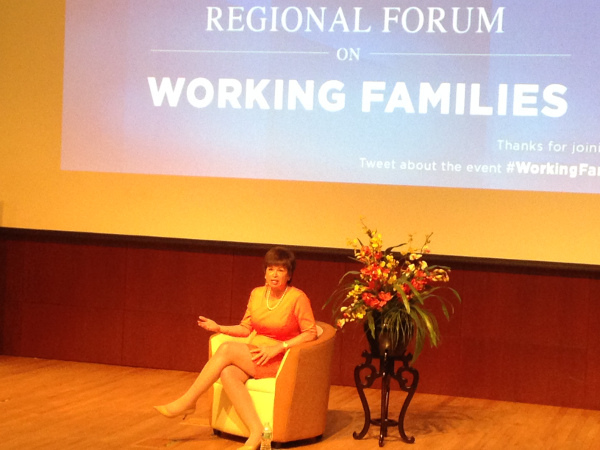 And, when time ran out at the end of the morning, Valerie Jarrett made a point of encouraging anyone interested to continue the discussion with her over twitter using the hashtag #WorkingFamilies with follow-up questions and ideas. There have been five of these open forums across the country this spring, and they are being followed by a White House Summit later this month. If you weren’t able to attend any of the regional forums, another way to get involved would be to share your story about the challenges faced by your own working family, either here in the comments section (we will pass along), or via the White House form. These stories will help inform the upcoming Summit. Even though there is indeed governmental support for change, change won’t happen without all of us chiming in—whether it’s by casting our votes, writing letters to our representatives, sharing our stories, or joining movements like 1 Million for Work Flexibility. As Secretary Perez himself highlighted, “Change doesn’t come from the nation’s capital—it starts here, with you, in incubators for democracy like this.” The Department of Labor, Congress, and the White House itself want to know what you have to say, so make sure your voice is heard!